Lately, I have been hearing from so many moms about the struggle to involve their kids with chores around the house. I am a firm believer in kids helping out and pitching in with household chores. I will not contribute to The Pussification of America. Oh, this was one of my most favorite reads in the past week. I do not feel guilty for teaching my kids responsibility, practical skills and self-management…..huge life lessons here. They will not have a rude awakening the day after I leave them at their college dorms and they are left to settle in. They will understand their own personal responsibility for doing their laundry and cleaning up after themselves. They will know what it means to take out the trash and walk the dog. They will know what it means to sort the dark laundry from the white laundry and what it means to clean out their own car. They will not expect clean socks and breakfast to fall from the sky. And, in all of this, I believe I am doing my kids and their future roommates or spouses a huge favor. I rallied two of the girls to help me with this cute and funny video. The girls would love if you left them some love. Please enjoy and then scroll down if you would like instructions for how I made these super simple chore charts. 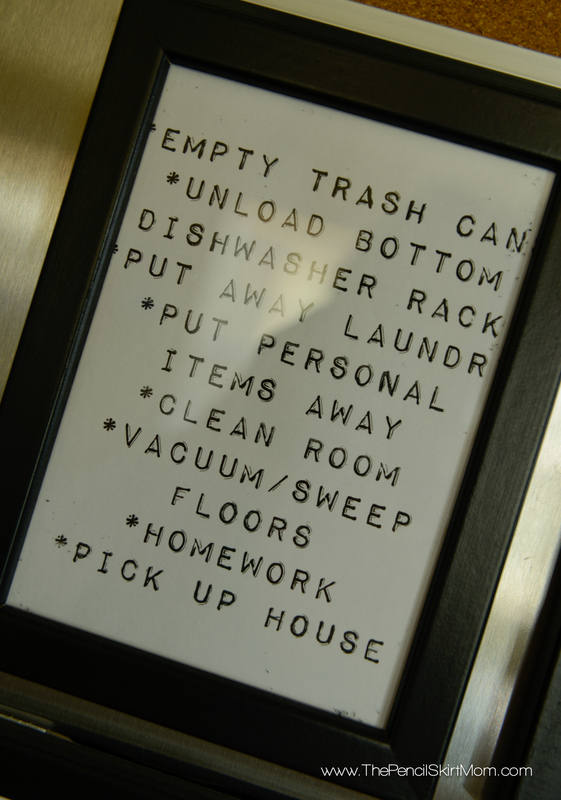 Simply type up an appropriate chore list for older kids that are able to read. Google images that fit the chores you are assigning to a younger kid who cannot read. For example, if you want to include brushing teeth on this list, search for an image that represents a toothbrush and toothpaste and is easily recognizable visually. Drag and drop these images onto a Pages or Word document that has been sized for a 5×7, or keep the images within those measurements. Make one of these documents for each of your kids dividing chores among them or as you like. Insert into frames. 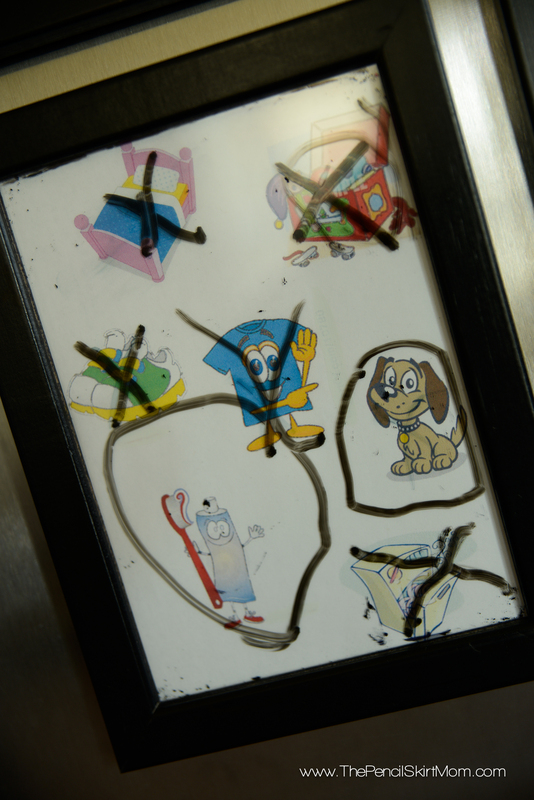 I like to use frames as they become a dry erase surface where kids can cross off their accomplishments. Also at the end of the day, Mom can see who took care of their responsibilities. 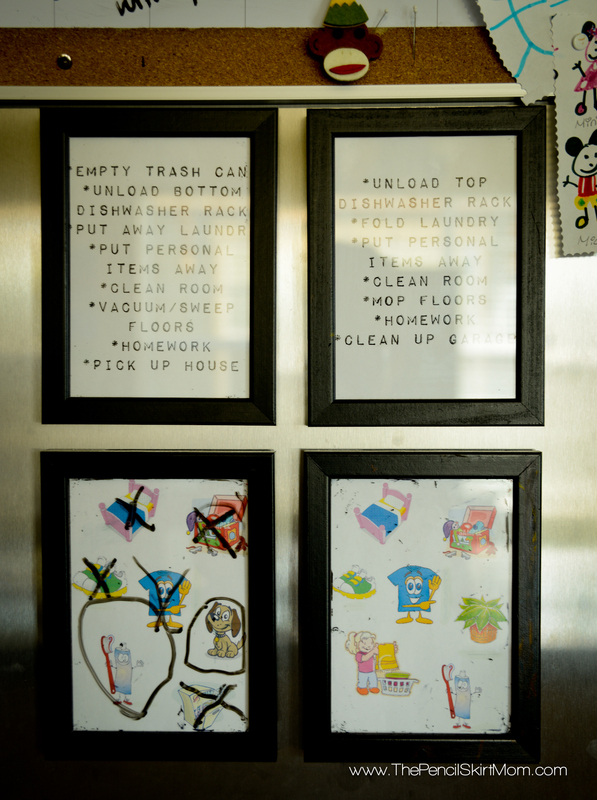 Use the one and only, uh-MAZing Command Strips (toota-la-loo) to hang the framed chore lists on the refrigerator like we do, a wall or wherever you like. Be sure to place them in an easily accessible place where kids and parents can easily see what’s happening at a glance. I thought about creating a free downloadable template for all you uh-MAZing mothas, but I really think they need to be personalized to be age-appropriate for your kids as well as consistent with your personal expectations. So go for it. It’s super simple and something you can do in about 45 minutes or less that will end up saving you tons of time and energy. PLUS, your kids will get to learn, what I think, are some darn awesome life-lessons! Leave me a comment with any questions or input you have. How do you handle chores at your house? What do you use for a rewarding system if you have one? What are your expectations? Awesome Becky!!! I think we will make one of these at our house. Seems like you are doing a fantastic job instilling a good work ethic in your kids, HIGH FIVE! Thanks for the “shout out”, I love to hear other writers/bloggers say they enjoy my words. Hi, Allie. Loved your article!! Thank you for stopping by. This is great. I haven’t ever officially assigned chores to my girls yet, but I do believe in them learning to do things. Kierra, who is 6, does great at doing whatever I ask of her, sometimes more. But mostly, I just love your girls, especially Jacie. She is just the cutest 4 year old and I love watching clips with her in them! Love the drama! “it’s just better all together for us to just do our chores…” why yes! it is! they did as FABULOUS job explaining the charts, adorable! and you my friend…love your clever and functional ideas. fave line -“it means we clean up poop n stuff..”she’s just the cutest and both did an excellent job articulating how the charts work. great job, girls. and great job, mama. so going to incorporate the picture chart. genius! Those girls are so amazing! What a great way to get them involved in your work too! They get to see how successful their momma is!! I am going to make one of these for Kalle! Do you recommend daily or weekly for a almost 3 year old?